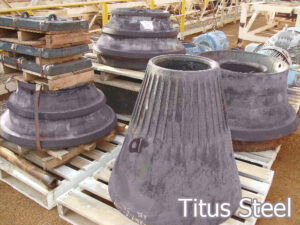 Titus Steel produces Wear and Impact Steel Castings for Mine Maintenance as well as Processing and Production equipment. Over the past 50 years, we have established long term strategic relationships with a select few major foundries in Canada, USA and China. Our supplier partnerships are transparent, based on mutual trust and a 50 year working relationship. Together with our customers, we manage all aspects of the supply chain including: design, alloy and process recommendations, samples, quality control and all logistics to your factory door.